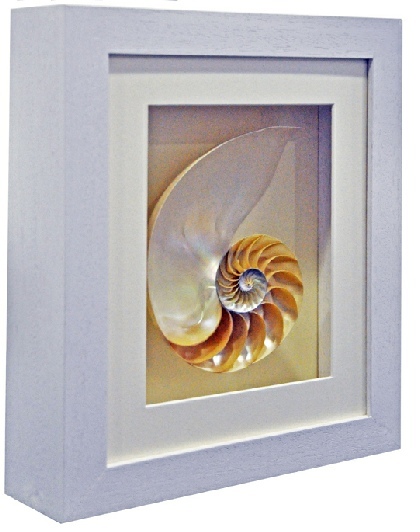 We framed this beautiful she shell for a maths teacher who wanted it to demonstrate the equation that shells grow by and which creates the wonderful spiral pattern of their structure. She chose a very deep white painted wood frame with a square contemporary look. She wanted a 40cm “shadow mount”. This keeps the framing simple and non-distracting so the attention is drawn to the shell. This frame is 7cm deep and is available in other finishes as well as a plain wood which we can paint or stain to the desired colour. The idea that mathematics is deeply implied in the natural forms goes back to the Ancient Greeks. Many aspects of the growth of plants and animals may be described by remarkably simple mathematical laws, in spite of their elaborate forms. An obvious example of this are the seashells and snails . Why do so many shells form spirals? As far as the animal that lives in a shell grows he needs the shell to grow with him in order to keep accommodating him. The fact that the animal which lives at the open edge of the shell places new shell material always in that edge, and faster on one side than the other, makes the shell to grow in a spiral. The rates at which shell material is secreted at different points of the open edge are presumably determined by the anatomy of the animal. And, surprisingly, even fairly small changes in such rates can have quite tremendous effects on the overall shape of the shell, which is in the origin of the existence of a great diversity of shells.